The holiday house Maroflin is situated in the small village of Crni Lug, close to the entrance of the National Park Risnjak. It is the former blacksmith's house. The ground floor is now a well furnished modern apartment. It can accommodate 2 to 4 persons. The upper floor is a nice apartment with 2 bedrooms and can accommodate max 5 persons. The house is equipped with a central heating system. The central hallway provides the entrance to both apartments. Adjacent to the house is a parking area for one car and a few yards from the house is a small public parking place. Both apartments can be rented together, so you can have 3 bedrooms at your disposal, 2 kitchens, 2 bathrooms and accommodation up to 9 persons. Via the front door you enter the central hallway with (lockable) wardrobe, in which you can store personal belongings, such as jackets, etc.. The stairs lead to your apartment. At the top of the stairs you will find a door which separates the apartment from the rest of the house. Opposite this door is the bathroom with bath/shower, toilet, bidet, and washbasin. The living-room has a nice and fully-equipped kitchen with dining-room, drawing-room and saloon with open fire. The sleeping facilities include 2 bedrooms: one with a double bed and another with two single beds. From the living-room you have direct access to the large terrace (38 yd2), which provides a gorgeous view over the hills of the National Park of Risnjak. The view is to the south-west. The terrace has wooden garden-furniture. Via the front door you enter the central hallway with (lockable) wardrobe, where you can store your personal belongings, such as jackets, etc.. In front of you is the door to your apartment. Once you are inside, you will find the bathroom on your right (shower, toilet and washbasin). At the front side of the house you will find the bedroom with two single beds. 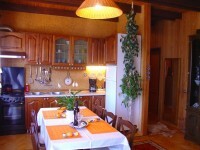 In the living-room are an open fire, a nice and well-equipped kitchen and a dining room. Behind the house is a terrace for the residents of apartment 1. The house has a nice garden which can be used by all tenants. The first part has some trees under which you can relax or make your own lunch on the fixed barbecue. 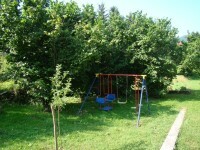 In another part of the garden, children can horse around or play on the swing. The garden is in the sun from sunrise until sunset.